except for Sgt R Wood via Drew MacIntyre, Sgt Higgins via Mark Chandler. Sergeant Edward Higgins - recorded on the Memorial in Chapel of St. Aloysius College at 45 Hill St. Glasgow. Sergeant Robert John Wood - recorded on the Memorial at St Mungo's Academy Glasgow. Flight Sergeant Ronald Oswald Charles Brett RAAF - recorded on main War Memorial in Canberra, Australia. Sergeant James Spence - recorded on the Village War Memorial, Althorpe, Scunthorpe. Sergeant Arthur Charles Wright - recorded on the Town War Memorial Abertillery Gwent and the Village War Memorial Llanhilleth, Gwent. Lancaster ED412/EM-Q of 207 Squadron at RAF Langar was one of 13 aircraft lost of the 295 which attacked Turin on July 13th 1943. These included that of Wg Cdr John Nettleton, CO of 44 Sqn who had won the Victoria Cross on the Augsburg daylight raid. 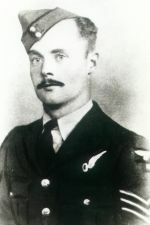 EM-Q, captained by 20 year old P/O Horace Badge, was one of nine aircraft from 207 Squadron assigned to this raid. Horace Badge had just been commissioned from his NCO rank of sergeant and this was to be his fourth operation. They took off at 2235 hrs. 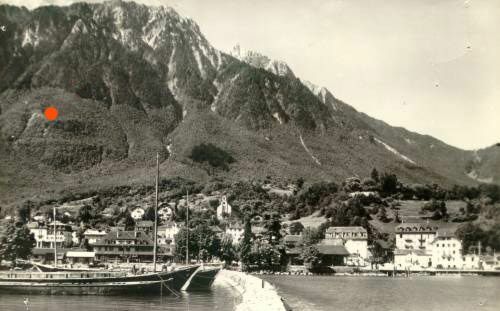 The outbound route was to take them over the Somme, then straight to Annecy, France, where pathfinder aircraft were to drop marker flares over Lake Annecy in order to keep the bombers clear of neutral Swiss territory. With 100 miles to the target, they were then to fly at 20,000 ft over the Alps with Mont Blanc on their left, before descending into Italy and on to Turin. Over France the bomber stream ran into very bad weather, electric storms and heavy thunderclouds making navigation very difficult. Over 100 Lancasters found themselves entering Swiss territory, on tracks spread between Nyon and Solothurn between 0004 and 0051 hrs Swiss time. At eight locations bombs fell on Swiss territory. According to a member of the Swiss Ground Forces ED412 is believed to have been hit by Swiss anti-aircraft fire from three batteries in the Jura mountains, which fired over 400 shells at the intruders. It was unusual for such fire to hit intruding aircraft, the objective being to make them leave Swiss airspace (but see also the comment from Pascal Blanchard at the foot of this page). Mortally damaged and in atrocious weather, ED412 crashed into Le Grammont, a mountain above the town of Le Bouveret at the Eastern end of Lake Geneva (Lac Leman), killing all the crew. 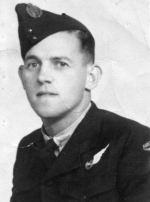 Eyewitness accounts given to Jim Wright, son of the Air Bomber, talk of the the aircraft breaking through the cloud cover over Vevey on the northern shore of Lake Geneva. It was trailing what looked like black smoke. Another eyewitness who was on Le Grammont as a boy remembers the aircraft circling at least twice, the second time lower than the first. There was then a brilliant white flash followed by an explosion and flames. About one o'clock, a lot of people noticed, in the direction of Bouveret, a bright light, similar to that produced by a flare, which seemed to be coming down from a black cloud bank. (A storm was blowing at the time). The light flashed to the ground and suddenly tall flames rose up In the forest, some 400 to 500 metres above the western end of Bouveret. A terrible explosion followed. It could be seen as far as Vevey and district, awakening a fair number of inhabitants and shaking the windows. The fire above Bouveret quickly faded in intensity; but for more than an hour it was possible, both by the naked eye and field-glasses, to make out numerous pockets of fire spread out within a fairly short radius, suggesting that a bomber had come down at this spot. It is possible, as there was a storm at the time, that the plane may have been struck by lightning. The responsible press-chief of the district informs us: During the night of the 12/13 July, at 0.55 hours, an English four engine plane crashed into the Grammont slopes about 500 metres from Bouveret, at a height of 900 metres. An enormous explosion was heard and huge flames rose up from the machine. The sector-commander and the fire-chief from Bouveret went to where the five bodies were found. Two of the crew have not yet been found. The forces of the explosion was such that several windows and window-panes were blown out in Bouveret. In Vevey itself, three big windows of the Hotel des 3 Couronnes were shattered. One of the hotel guests, the Aga Khan, was hit on the head by flying glass which caused no damage however. 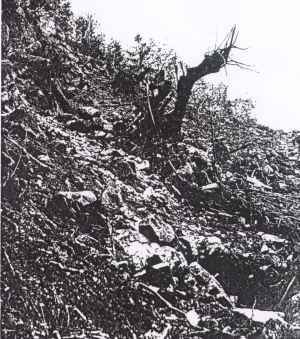 The English four engine plane crashed against two sides of le Grammont near the Bussien quarries above le Bouveret. 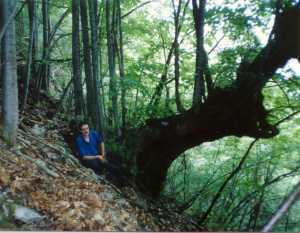 It came down right in the middle of forest which was destroyed over an area of 150/200 metres. On hitting the ground, the plane broke up into a thousand pieces and produced a crater ending in a gully filled with debris and loose rock which rolled to the foot of the hill. 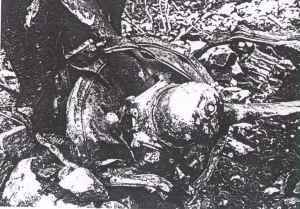 Incendiary bombs were found in several places. It is not yet known whether the full bomb load exploded after the crash. The only certainty is that no (bomb) pieces have been recovered. The rush of flames was so fierce (obviously from an exploded bomb) that several windows were broken in le Bouveret of course and in the surrounding district. The paper 'Revue' points out that at Montreux a big mirror 3.50 metres long and 2.50 metres hight, seven millimetres thick, was shattered in the hall of the Hotel Eden. A window was blown in under the 'Palace'. Later, another report stated that nearly all the houses in Le Bouveret had a large number of panes and windows broken. At the Co-operative, large mirrors worth about 2000 F. some others in Hotel Bellevue worth several hundred francs, have been shattered. Shutters have been blown off. The church has not been spared. On its floor fragments of gypsum have been found and two others of the stained glass windows have been broken. "As was to be expected a very big crowd flocked to the St. Martins Cemetery yesterday afternoon to be present at the funeral of the British airmen, victims of implacable fate/duty, who had on Tuesday night come down above Bouveret and on the Alp de Thyond (Valais). Those responsible for the control of the public, a task well organised by the police under the command of M. Carrel, did not have an easy task and it was only with difficulty that they could curb the enthusiasm of the crowd once they were allowed free entry. It was a splendid afternoon and bright sunlight shone down on the St. Martin's cemetery where the slight cypress trees, as upright and straight as candles, offer intermittent shade. At 15.00 hours, already a great crowd was thronging on the St. Martin terrace where the official procession was to form up. Behind the British cemetery the final preparations were being completed. Innumerable and splendid wreaths - perhaps a hundred - were set out on trestles, producing a guard of flowers for the coffins. They had been sent from every part of Switzerland, from every British community. Notably present were representatives from the British legation in Berne, the R.A.F., the British Legion, English internees, Greek, Belgium, Dutch, Yugloslavia colonies, the U.S.A., Palestine, etc. About 16.20 hours, a battalion brass band plays Beethoven's Funeral March. A moving moment. The official personalities and delegations arrive. The procession is headed by the representatives of the British Legation In Berne, amonst others, His Excellency Mr. Clifford J. Norton, C.M.G., C.V.P., envoy extraordinary and plenipotentiary minister, Air Commodore F.M.F. West, V.C.., MC., Air Attache Colonel H.A. Cartwrlght, M.C., Military Attache, Major H.N. Fryer, assistant Military Attache. They are followed by representatives from the U.N. diplomatic corps, military attaches in full uniform, the Verney municipal representative, Officers from our Army, headed by Major Bossier of the 10th Territorial 'arrondissement' commanded by Colonel Carrupt, plus representatives of Air Defence are present. The Aga Khan, spiritual leader of 80 million Muslems, staying at the Hotel des 3 Couronnes is also present. A fine wreath from him had been sent beforehand. the Badge crew graves are by the hedge. There are no speeches. Only the church officials speak; they are the English priests Legg (Vevey), Heywood (Clarens), Middleton (Lausanne), Williams (Geneva) and Father Kurfurat (Vevey). They all wear surplice. Before the reading of the Gospels, English soldiers (interned) and Swiss soldiers took their places at the foot and head of the 14 coffins. They are at attention. 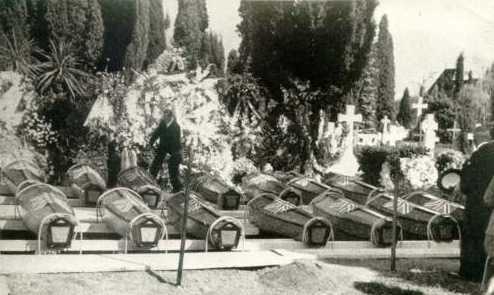 The band plays 'God Save The King'; the slab supporting the coffins are lifted, the soldiers slowly let them down on ropes to the bottom of the communal graves. The Absolution is given by Father Kurfurst, then Mr. Legg and the British Minister perform the symbolic gesture of throwing handfuls of earth onto the coffins. Three salvos fired by a Swiss military detachment frighten the birds and small children (whom one might have wished to have been elsewhere than at a cemetery), trumpets sound and the ceremony ends with the laying of magnificent wereaths by the British Minister at Berne and the R.A.F. representative. 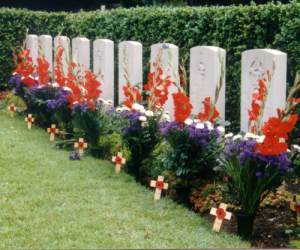 These wreaths were brought by 4 English soldiers. They placed them against the posts previously set up in front of the graves. Impressed by so much simplicity coupled with an absence of words which said much more than a thousand speeches, the crowd slowly withdraws as the military attaches come and bow before the graves where a quantity of flowers simple bunches, are piled up on the ground, an expression of the warmth of feeling felt towards the victims of the war. " 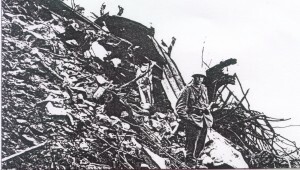 Thirteen 4-engined planes have not come back from this air raid. The Italian communique says that the centre of Turin underwent considerable damage. There are 101 dead and 203 wounded. At the R.A.F. H.Q. it is stated : during Tuesday night, strong formations of bombers attacked the industrial Italian town of Turin, which has a great importance not only by its industrial output, but also as a railway junction. The British bombers arrived over Turin in very propitious weather and moonlight made it easier for them to reconnoitre the targets. Thousands of incendiary and explosive bombs were launched, causing vast fires and heavy damages. On their way there and back the aircraft met with heavy storms which originated several crashes. The memorial to the Badge crew is sited by the shore of Lake Geneva (Lac Leman). 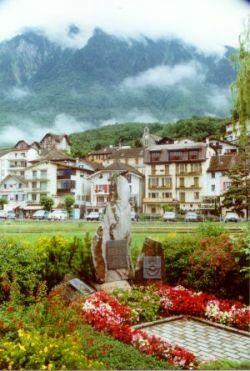 It was erected by the people of Le Bouveret, a village very near to the French border. 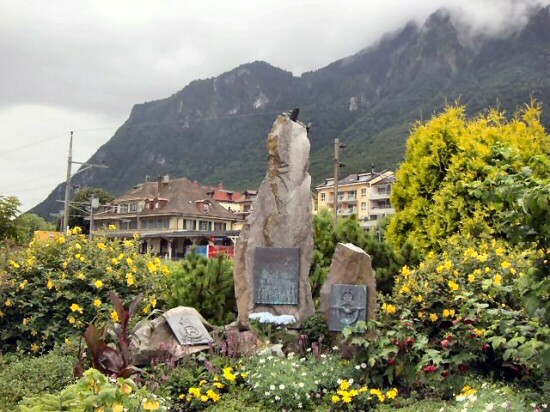 There was very close involvement of the RAFA Switzerland branch, which also contributed significantly to the cost of the monument and was responsible for finding the stones in a local quarry as well as organising the plaques from a foundry in the Jura. The dedication was on 11th July 1993 in the presence of some of the crew's relatives and representatives of 207 Sqn RAF Association and military and civic officials. As the Le Bouveret memorial is by the lakeside, it is seen by the many visitors touring Lac Leman. Nearby, a Union Jack fluttering in the breeze also attracts attention to the memorial. It is said that small children ask to be lifted to touch the Lancaster on top of the plinth. 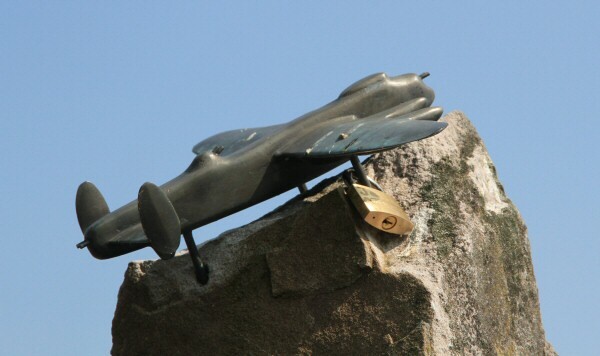 The left hand plinth bears a plaque showing the 207 Squadron crest. crash in French and English. The plaque on the right hand plinth is the RAF crest. For all those starting out for Le Bouveret, a small town on the South shore of Lac Leman on the morning of 14 July 2013 to commemorate the crash of a Lancaster bomber of No. 207 Sqn Royal Air Force in the night of 12/13 July 1943, the 14th of July 2013 started and remained a pleasant day. But 70 years before, in the night of 12/13 July, 1943, Pilot Officer Badge and his crew of Lancaster ED412 of the RAF’s No. 207 Sqn was scheduled to be at 18,000ft when passing over the Alps en route to bomb targets in Turin, but may have been forced to lose height to maintain speed in an active storm cloud. He obviously calculated that they were over the middle of Lac Leman, but as he orbited, his aircraft had drifted to the southern coastal area and over Le Bouveret the Lancaster hit the side of the nearby Grammont mountain and its full bombload exploded, killing all the crew. 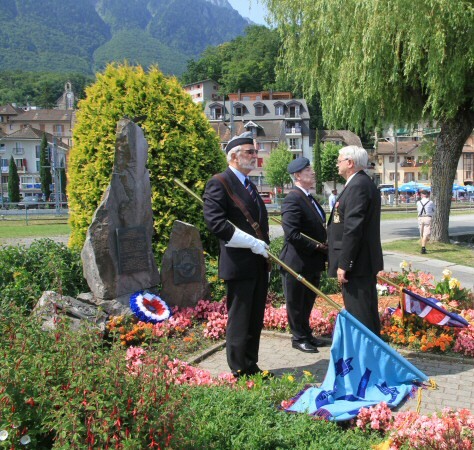 Seventy years on and it is the 70th anniversary of that tragic event, which is commemorated biennially by more than 30 RAFA Swiss Branch members and friends and the local Port Valais authority, whose President M. Pierre Zoppeletto, (equivalent to Mayor) welcomed our members and friends before the granite memorial by the lake, topped by its metal model Lancaster and with the names of the crew of ED412 on a plaque near the base. This year there were no relatives of the crash crew present among some thirty attending the commemoration. Roy Damary, our Branch Chaplain and Lay Preacher led the service and gave the sermon, with various prayers being read by RAFA Branch Chairman, Bryan Pattison and others. The wreath to No. 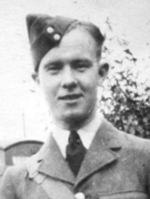 207 Squadron was laid by Bryan Pattison. The National and Branch Standards were dipped for the two-minute Silence. The service ended with the Standard Bearers marching off. After the service most took up M.Zoppeletto’s invitation to take a verre de l’amitié in a local “salle communale”- a welcome gesture! Also after the service, a local man in his 40s, with a 4x4 vehicle capable of mounting to the level of the crash site was explaining to Bryan that he was using his 4x4 vehicle to visit the crash site occasionally to keep it tidy and to take visitors. Bryan will approach M.Zoppeletto for more information. Thirty RAFA members and friends had booked lunch in the nearby Hotel La Tour above the level of the lakeside. The atmosphere was convivial during the Lunch and the meal was good value. Undeniably it was a most pleasant day. The 467 Squadron crew were aboard Lancaster III ED531 PO-T, which took off from RAF Bottesford at 2249 on 12 July 1943 to take part in the same raid on Turin. 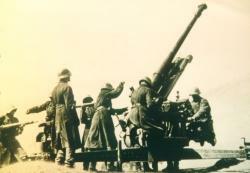 It is also believed to have been engaged by flak. Part of the bomb load was jettisoned. Soon afterwards, the Lancaster flew into high tension cables near Thyon and crashed at 0120 local time. Beneath a tree there is a brass plaque, mounted on a rock. It is dated 5th June 1983 and was placed to honour those who to that date had lost their lives on military service in the region. 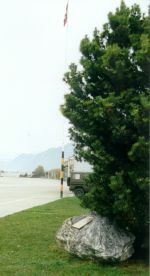 The airfield is nowadays divided in two parts: one side is open to the civil traffic. The other side of the runway, where the memorial stands, is still an active military airbase and is closed to the public. ISBN: 0752434209. Paperback Book, 276 Pages, 235 x 156 mm. An illustrated record of the RAF's incursions into Switzerland during the Second World World, including aircraft that crashed or bombed there, and the crews that made for this safe haven in occupied Europe. "The coverage for 'our' crew is great." 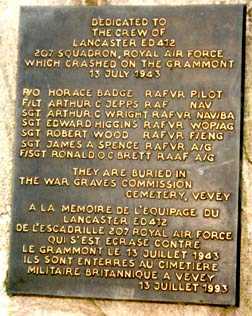 7 June 2006: I came across the account of the loss of Lancaster WD412/EM-Q on the internet today. Extraordinarily detailed and very moving. I am so pleased that it has been recorded for posterity. I look after the Old Shebbearians' section of the Shebbearian magazine and am always looking for material to help encourage support for the Old Shebbearian War Memorial Fund. Pilot Officer, Royal Air Force: captain of a bomber which crashed near Vevey in Switzerland on 12th July, 1943. "A few months before he was killed Badge stood in the Quad talking to us, chuckling at the unexpected destiny which had called him from his father's Devon farm: fit, solid, unperturbed, he grinned as he recounted awkward and dangerous incidents during his flying instruction in Canada and England. In his even tones there was not the mildest hint of swagger: as in his eyes there was no hint, no shadow of fear: Devon stock this. He went away to fly a Stirling; and shortly after a great flight to Turin there came the news that his aircraft, and another, had crashed near Vevey in Switzerland. He and his crew lie buried on a hill above the old church of Saint Martin that looks out over the Lake of Geneva." It was hard to believe that so much life was quenched." Harry adds that Shebbear then was a small, remote boarding school in North Devon with a strong pacifist tradition, yet 48 old boys were killed in World War One and 35 in World War Two. He has an RAF interest in that his father, who he never knew, "was killed returning from a raid over Germany with 144 Squadron in 1942. At 26, he was a relatively old man, compared with Horace Badge." 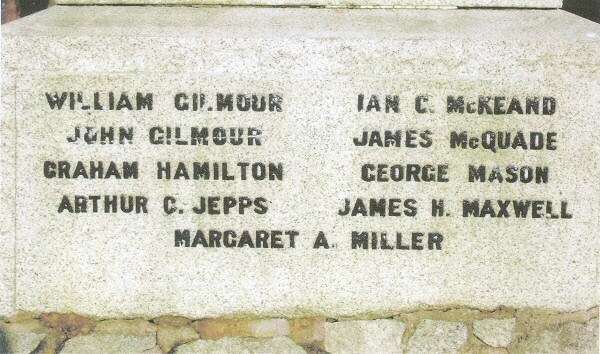 26 January 2009, updated 28 Mar 2010: Sheila Stuart and Campbell Provan write from the village of Stepps in North Lanarkshire, Scotland: We were delighted to find this website in our research into our village war memorials. 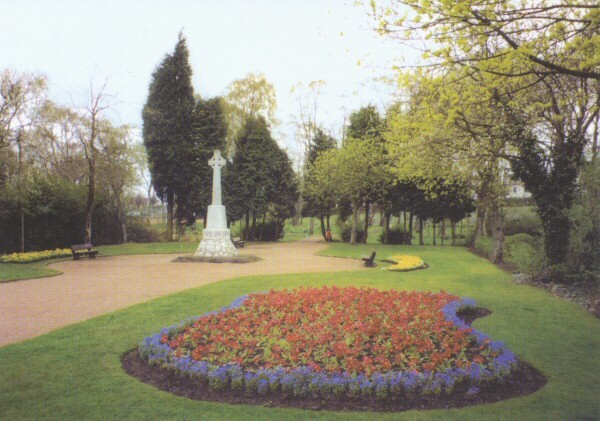 Arthur Charles Jepps is on our village war memorial in the park here. They write: Arthur Charles Jepps was the son of William and Lottie Jepps (nee Marshall) and the husband of Fanny Love Jepps (nee Watson). He was born on 21 September 1913, in Letchworth. In 1945/6 Mrs FL Jepps was living at 9 Whitehill Avenue, Stepps: there was a daughter, Charlotte J Jepps, born in 1941 in Forres, Morayshire. Pascal Blanchard's website (in French) on the loss of this aircraft.